A trip to the dentist can be difficult for children, but not if you’re bringing them to the right office. It’s essential for children to understand the importance of dental health from a young age, so bringing them to an inviting and comfortable space will make the whole experience better for everyone. 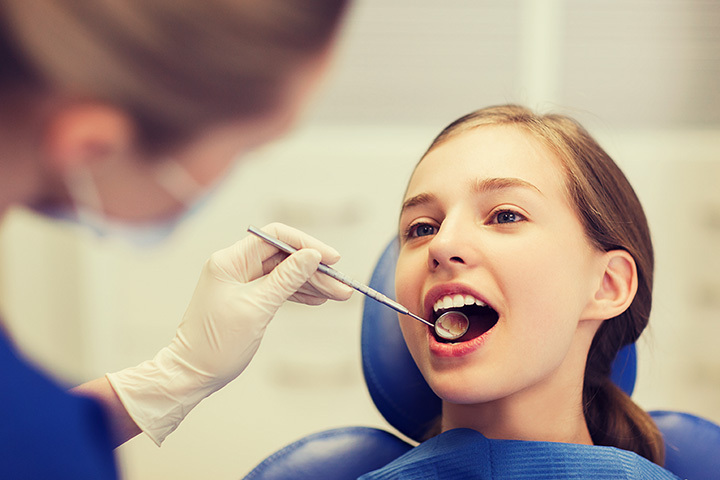 Here are the 10 best kid-friendly dentists in Michigan! Allendale's Grand Valley Dentistry features a kid-friendly operation that looks to help on several dental fronts. It not only offers clever insight—bring the kid into the dentist early and use cartoon tracks as a way to track time spent brushing teeth and so on—but it also looks for a means to encourage the kids to get more interested in oral health. A tall order, but getting kids interested in brushing and flossing helps ensure they'll carry on with such activities down the road, improving overall oral health right from the beginning. Dr. Keith Cohrs has a goal of making a child’s dental experience a fun and comfortable one. Cohrs Family Dentistry cares for children as young as 12 months old. The waiting area features fun cartoons, video games, and plenty of toys. Each dental chair actually has a television monitor playing cartoons, guaranteed to distract and calm a nervous child. She was such a good helper! Out in Holland, Huisman Family Dentistry has a particular focus on the children. It's not so much because of their décor or their special options, but rather because of the services offered. With a slate of child-geared services like oral sealants and sports mouth guards, Huisman Family Dentistry delivers what the children need for their best oral health. One system in particular, the Cari-Free System, allows for an easy way to check for tooth decay at the bacterial level, which allows it to be interdicted quickly before it becomes a cavity. Olde Orchard employs experts in the field of pediatric dentistry. At Olde Orchard, the professionals strive to provide a painless and positive experience with cleanings, exams, sealants, fluoride, x-rays, or whatever experience a child might have at the dentist. For preschool age children, they recommend bringing in a child earlier in the morning after they are more well-rested. Kingma Pediatric Dentistry in Grand Rapids puts kids right at the top of the list. A focus on prevention and up-to-the-moment laser dentistry definitely helps matters, but Kingma's focus on special-needs children is especially noteworthy. Kingma even has a special page on his website called “I'm Going to the Dentist!”, a “social story for children” geared toward showing new patients what a trip to the dentist is actually like. That works to put such patients at ease in a new environment. “The pediatricians of dentistry,” that's how Golnick Pediatric Dental Associates—with offices in Taylor and West Bloomfield—bills itself. It shows in the office's décor, which is appropriately kid-friendly by most every standard and heavily features Disney characters from a host of films. It's not just the wallpaper, of course, that makes this kid-friendly—check out the motivational charts to push kids toward better habits, and activity pages to teach and entertain. Livonia's Livonia Dental Group breaks with convention in some points, recommending the first visit take place around age three, while some recommend the first visit start at a year old. That's somewhat unusual, but Livonia Dental provides a slate of reasons behind its projection, and works to establish “...a non-threatening dental experience” for the young. Additionally, fluoride supplements and dental sealants are on hand as a great way to help protect teeth against less-than-expert brushing. Checking to see if her teeth are Halloween candy ready! Ann Arbor Pediatric Dentistry in Ann Arbor has a particular focus on children. Not only does it subscribe to the notion that children should be brought to dentists by age one, but also focuses on providing the best in care with the least in discomfort. It not only has a wealth of experience in caring for children's dental health, but also as training in caring for special needs children. Bright & early 7am cleaning. Tri City Kids Pediatric Dentistry, located in Bay City, covers the “tri-city” area of Bay City, Saginaw and Midland. Delivering not only a slate of useful services—from space maintainers to digital X-rays for better results to fluoride treatment and more—but also informative matter like on the importance of good diet in oral health and the importance of baby teeth in a child's oral development. There’s no way your child will dread going to the dentist after they see Macomb Children’s Dentistry’s office. The waiting rooms are equipped with iPads and feature a train table. While children are getting their dental treatment, they can watch their favorite kid shows and cartoons—a perfect distraction that will make the experience painless.